Below are several updates on neighborhood developments, and restaurant/retail business openings. - 1000 sq. ft. for the retail portion. Total leased space is 2000 sq. ft.
- Entire city block from West 1st Street to West 2nd Street between C and D Streets. 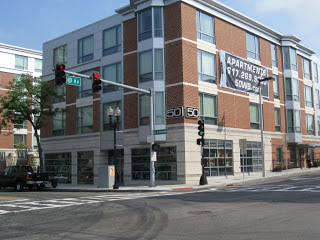 - West Square filed a notice for project change on 7/20/2011 to include 259 Units with 143 Parking Spaces. This was denied by the Boston Redevelopment Authority due to parking.